Have an adventure in Candy Land on January 28th, 2018 at the Double Tree by Hilton in downtown Cedar Rapids. 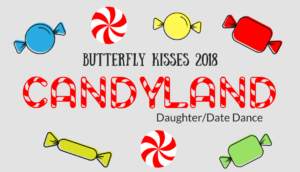 Junior League of Cedar Rapids will be hosting its 16th Annual Butterfly Kisses daughter/date dance, with this year’s candy land theme! The afternoon will include a light lunch, professional photos, and plenty of dancing. Proceeds from this event fund all Junior League of Cedar Rapids programs, from Bridging the G.A.P. to our scholarship fund and training programs.